- Goalie Adjustable Helmet with unbreakable material. - Optically true injected polycarbonate visor duly silicon hard coated for scratch resistance properties. - Quick release chinstrap mechanism for ease of operation & safety. We offer helmets for cricket player, which are manufactured from international sports standards. 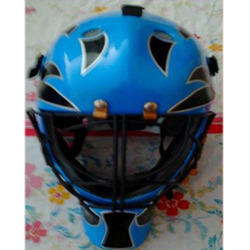 These are available in various sizes and color combination thus providing full protection to the player. We are a trusted name engaged in the manufacturing of superior quality sports safety helmet. These products are made by using high grade raw material such as epoxy resin, fibre glass reinforce plastic and nylon that provides high durability and strength to our product range. 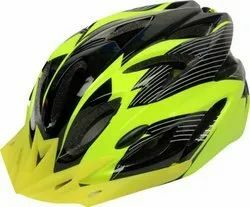 We offer these helmets in various sizes and colors at the most competitive prices. Made from quality PVC (Poly-Vinyl Chloride), with polyester lining. Can be made from top quality PU. Shaped for maximum protection on the Cheeks, Chain, Forehead, Ears and Neck. Filled with rubber foam for maximum protection. Owing to the efforts of our dedicated team of professionals, we have been constantly engaged in offering the best quality Hurling Helmet.